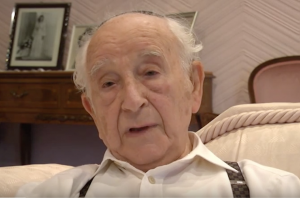 (JTA) — Chaim Ferster, a Polish-Jewish Holocaust survivor who spent time in eight concentration camps, has died. Ferster died Monday in Manchester, England, from pneumonia and a kidney infection, surrounded by his three sons and other family members, the BBC reported. He was 94. He was born in Sosnowiec, Poland, in an Orthodox Jewish family. In 1943, the Nazis forced him to leave his home, and he spent time in concentration camps in Germany and Poland, including Auschwitz and Buchenwald. Ferster, his sister Manya and a cousin were the only members of their family to survive the Holocaust. Manya is now 92. After World War II, Ferster moved to England, where he found work repairing sewing machines. He later set up “a series of successful businesses,” according to the BBC. Ferster lectured about the Holocaust in schools and colleges. “His greatest fear was that people would forget the horrors of the Holocaust,” his son Stuart told the BBC. On Monday, the Greater Manchester Police shared a video of Ferster playing the Israeli national anthem, “Hatikvah,” on the violin during a Jan. 27 visit to its headquarters on International Holocaust Remembrance Day. AMSTERDAM (JTA) — The Jews of Friesland, a region in the northern Netherlands, are not known for stories with happy endings. During the Holocaust, Friesland’s vibrant Jewish community was forever obliterated, including its endemic customs and distinct Yiddish dialect. It is one of the starkest examples of how the Holocaust decimated and irreparably changed Dutch Jewry. That’s why the recent surfacing of a unique film from 1939 showing the wedding of a Frisian Jewish couple who escaped the genocide is generating remarkable reactions from local media and Dutch state historians here over the past week. 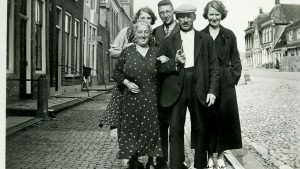 The film is the only known footage of Frisian Jewish life from before the Holocaust. Its discovery comes amid a wave of popular interest in the Holocaust in the Netherlands, including in films and series with record ratings and in the construction of monuments – most recently with the opening last year of the National Holocaust Museum in Amsterdam. The silent, black-and-white film was the subject of a special aired last week in prime time by the region’s public broadcaster, Omrop Fryslân. All the region’s main dailies reported on it, as did some national publications — including the Netherlands’ main television guide. Placed on YouTube by the Frisian Film Archive on January 25, it received thousands of hits, becoming the archive’s second-most-watched video over the past two years. The couple’s children handed it over this month to the Frisian Film Archive after finding it in their late mother’s suitcase in 2008. They had hung onto it for nearly a decade to “come to terms with it,” Andre Boers, one of the couple’s three children, told JTA on Tuesday. The seven-minute film posted online last week — excerpted from longer footage — shows the bride, Mimi Dwinger, wearing a form-fitting satin wedding dress and riding a horse-drawn carriage with her fiancé, Barend Boers. It’s a sunny spring day and the couple is headed from Leeuwarden City Hall to the local synagogue. As elegantly dressed women and men wearing top hats stream into the synagogue, other locals from the Jewish quarter of this poor, provincial city gather around the entrance for a better view of what seems to be an unusually opulent affair. Inside the synagogue, which seems full to capacity with wedding guests, the region’s chief rabbi, Abraham Salomon Levisson, officiates. He’s wearing the black hexagonal hat favored by Sephardic rabbis — an influence brought to Holland by Portuguese Jews. Smiling, Boers signs the ketubah, the religious marriage contract. The ring is too small for a comfortable fit. Boers flashes an amused smile at the camera as Dwinger quickly licks her finger to make it easier to slip on the jewelry. Touchingly, Boers holds up her veil while she does this. The newlywed couple appears relaxed at the reception held at the local Jewish kosher hotel, The German Eagle. The guests chat and, after a few glasses of advocaat — Dutch eggnog — they giggle at the cameraman. The excerpt — the full footage was given on loan to the archive earlier this month — ends with Boers gently kissing his wife on the forehead. Nothing about the film suggests that the people featured in it had any idea their world was coming to an end. Just a year after filming, the people in the movie would come under the Nazi occupation that decimated the Frisian Jewish community, along with 75 percent of Dutch Jews — the highest death rate in occupied Western Europe. For example, the body of the congregation’s rabbi, Levisson, was found in 1945 inside a German cattle car that was full of dead or dying Jews when the advancing Russian army encountered it in Eastern Europe. The bride’s father, Moses, was arrested and sent to the death camps in 1943. Fewer than 10 members of his extended family of about 100 survived the war, according to Andre Boers. Though the Jews in the film appear relaxed, Frisian Jews did have an inkling of the storm heading their way, according to Hans Groeneweg, a historian at the Frisian Resistance Museum, a state-funded institution entrusted with documenting the occupation years. “The bride you see smiling in that film, she’s a woman running for her life,” he told the Frisian Broadcasting Authority in a 25-minute round table discussion that aired January 25. Levisson was especially aware of the danger, as he had been helping settle in the Netherlands refugees from neighboring Nazi Germany for years. While few of their relatives and guests survived, the lovebirds plotted the escape that saw them survive against all odds. They escaped the Netherlands in 1942, through France and Spain to Jamaica. Boers enlisted to fight with the Allies, while his wife volunteered to work for the British War Office. Boers participated in the liberation of the Netherlands in 1944 as part of a Dutch brigade that fought embedded within the Canadian army. The couple returned to the liberated Netherlands. Boers died in 1979 at 69. His widow, Mimi, passed away nine years ago at 90. Her three children now live in Amsterdam and Israel. The Frisian Film Archive learned of the film’s existence after the family offered to give the 16mm footage to the archive on loan. “For decades we’ve been looking for footage from the Jewish community before the war, and now here it is,” Syds Wiersma, an archivist for the Frisian Film Archive, told the regional broadcaster last week. The film’s appeal, according to Groeneweg, the resistance museum historian, isn’t just its rarity. “It offers hope — hope that not all the people in that film died in the camps, that a few managed to escape, after all,” he said. But for Andre Boers, Mimi and Barend’s middle child, who is living in Israel, the film has a far more personal significance. Before the family found it, he had not seen moving images of many of the relatives featured. It’s a “highly emotional opportunity to see my grandparents, great-grandmother, uncles, aunties and many others just a few years before most of them were murdered by the Nazis,” he wrote last week on Facebook. BERLIN — A schoolbook publisher in the German capital has apologized for using an anti-Semitic illustration in a text about the euro crisis and said it will send a substitute page to schools. The substitute page can be pasted in, and the book will not be removed from German schools’ bookshelves. Klett-Verlag told Vice magazine blogger Philipp Frohn that the “regrettable mistake” would be corrected in a future edition, which will not come out for several years. The notion that the Jewish banking family is controlling the world for its own selfish purposes “is a classic anti-Semitic conspiracy theory that the Nazis made good use of,” Frohn wrote. “The message to pupils … is clear: The driving force behind the whole nasty affair is a bank. A Jewish bank,” he added. His current illustrations include portrayals of Hillary Clinton as a zombie; Donald Trump chained around the neck by a golden fob bearing the words “The Fed” and a Star of David; and work suggesting that mass shootings in schools are a Jewish conspiracy against the NRA. Frohn said the publisher reacted with surprise to his questions about how Dees’ illustration ended up in the textbook, which has been used in schools across Germany since 2012. The publisher responded after “internal discussions” to say that “the use of this caricature is in fact a regrettable mistake,” and promising to remove the image from its online version of the chapter “as soon as possible.” But it could take years before a new edition is published, a spokesperson added. 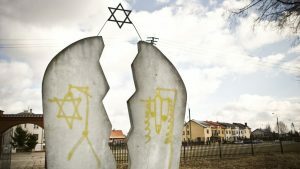 WARSAW — Poland has seen a rise in anti-Semitism over the last two years, partly fueled by Europe’s migrant crisis, according to a study released on Tuesday. The University of Warsaw’s Center for Research on Prejudice found acceptance for anti-Semitic hate speech — especially among young Poles on the internet — rose from 2014 to 2016 compared to previous years. Their study was based on a sample of 1,000 adults and 700 youths. The number of surveyed Poles who declared positive attitudes towards Jews dropped from 28 percent in 2015 to 23% in 2016. Researchers attribute the increase to a spike in Islamophobia and anti-migrant sentiment triggered by Europe’s worst migrant crisis since World War II. Many of the migrants were from conflict-ridden countries like Syria and Libya. Politicians in eastern EU states, notably Poland’s populist leader Jaroslaw Kaczynski, were quick to raise the specter of Islamic State militants carrying out terror attacks once inside the bloc. Very few refugees or migrants arrived in Poland after Kaczynski’s governing Law and Justice (PiS) party refused them entry. The study found that 37% of those surveyed voiced negative attitudes towards Jews in 2016 compared to 32% the previous year. Fifty-six percent said they would not accept a Jewish person in their family, an increase of nearly 10 points compared to 2014. Nearly a third (32%) said they did not want Jewish neighbors, compared to 27% in 2014. The Jewish community in Poland, with a population of 38 million, has fewer than 10,000 people. Prior to the Holocaust, it boasted 3.3 million members, or around 10% of the Polish population. Up to 300,000 Polish Jews survived the war, but most then fled the country, many to Israel. Around 11% of adults and 24% of younger Poles admitted to making occasional anti-Semitic remarks. How should we define the authentic remains of the German Nazi concentration and extermination camp Auschwitz-Birkenau, which today are protected and preserved by the Auschwitz Memorial? 150 buildings, about 300 ruins, including those of five gas chambers and four crematoria in Birkenau that are especially important to the history of the camp. Over 13 kilometres of fences, and more than three thousand concrete fence posts. About 110,000 shoes and 3,800 suitcases of victims, 2,100 of which bear the names of their owners. About 39,000 negatives of registration photographs of prisoners, 48 volumes with about 70,000 of their death certificates, 248 volumes of Zentralbauleitung documents, and 13,000 letters and cards mailed from the camp by prisoners. This is just the beginning of the list which summarizes the extent and the challenge of our Museum. There is also another priceless part of our authentic collection: the archives, with over 30,000 pages of testimonies of survivors and eyewitnesses as well as over 45,000 pages of their memoirs. These are individual stories of people who survived, stories which can help us today to comprehend the existing architecture of the former camp through personal experiences, emotions and dilemmas. I agree with the words of Menachem Rosensaft quoted by Tom Tillett that “as much as any other event, if not more so, the Holocaust requires the chronicler to be scrupulously accurate.” Yet Tillet is not accurate in saying that “the large building where most prisoners first entered Auschwitz I and went through processing is lost due to its contemporary usage,” since, in fact, this building was never actually completed during the war. This year the Auschwitz Memorial will be 70 years old. It was created thanks to the efforts of survivors in July 1947 and in many ways, the way we operate today is based on their decisions. One such decision was to organize and house exhibitions, archives, collections and the whole management of the institution of memory in the much better constructed buildings of Auschwitz I, and to leave Birkenau in as authentic a condition as possible. Another key decision made by survivors was to create replicas of a few structures in Auschwitz I that Germans had destroyed: They reconstructed the execution wall and one of the gallows, and used original parts to reconstruct two crematoria ovens inside the building that had housed both the original crematorium and the original gas chamber. 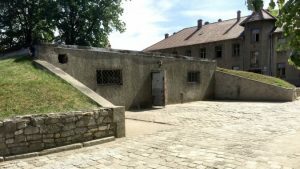 They wanted to allow people to enter the only standing building of a former gas chamber, as all the other gas chambers and crematories in Birkenau were ruins, and those ruins were kept as such. Almost all visitors see both parts of the Memorial. They see exhibitions and learn many historical facts about the creation and functioning of the Auschwitz complex — including Birkenau. After this educational introduction, they have the unique opportunity to better understand what they learned by looking at the remains of Birkenau itself. We are aware that the main exhibition was created by survivors in 1955. This is why one of the most important current projects of the Memorial is creating a new exhibition, which will not only tell the story of extermination and concentration camps from the perspective of victims but will also show the world of perpetrators and the place of Auschwitz among Nazi German state institutions. The three parts of the new exhibition should be open in 2021, 2023 and 2025, respectively. We also are aware that the Memorial’s infrastructure, which was originally set up decades ago to serve up to 500,000 people annually, is not equipped for the volume of visitors we receive today (in 2016, for instance, we received over two million visitors.) We understand that people who visit and spend long hours at the Memorial need some basic accommodations, such as a bookstore, restrooms, and even a small vending area. This is why we have already started the project of creating a completely new visitors center — importantly, outside the core historical area. We are aware that tourists visit the Memorial, but from our perspective the Auschwitz Memorial is not a tourist attraction. First and foremost, it is a place where we commemorate the fate and life stories of the 1.3 million people deported there: 1.1 million Jews, 150,000 Poles, 23,000 Sinti and Roma, 15,000 Soviet prisoners of war, and others. The visitors are told at the beginning of every guided tour that they are about to enter a cemetery-like site, and they should behave appropriately. Most people respect that. It’s also important to note that no other former German Nazi concentration camp or extermination center sites in Europe is in such authentic condition today, nor have any been so successfully preserved. The management at the Memorial can be so effective in our preservation efforts because of international consensus granted to us by the International Auschwitz Council, a consultative-advisory organ of the Polish Prime Minister’s office dedicated to preserving, maintaining and developing the site of Auschwitz and other Memorials located in today’s Poland. Its members include world-renowned authorities on the history of concentration camps and the Holocaust. The Auschwitz Memorial is also a place of education, with learning activities developed at the International Center for Education about Auschwitz and the Holocaust, which was created in 2005. Last year, we finally secured funding that will allow us to create a modern headquarters for the center, with lecture rooms and all necessary infrastructure to conduct more extensive education programs for people from around the world. 362 days a year, our 286 educators explain the difficult and sensitive history of Auschwitz and its victims in 17 languages. They help visitors coming from all around the world to understand this complicated topic using all the authentic objects and locations at hand. They walk through the historical sites, they use exhibitions, and, as a result, they keep the authentic stories of survivors alive by telling them to people. Many visitors come to the Memorial prepared. Teachers and educational leaders understand the role of bringing their students to the historic site not only as a lesson of history but also one of civic education — as Auschwitz has been and will continue be a warning to humanity. But we also truly believe that many people who begin their visit as tourists later became messengers of remembrance, and that this happens thanks to experiencing the authenticity of the site as guided by educators. Visiting the former camp itself is a valuable personal experience which can teach and change people. The fact that visitors might initially attend the site as tourists does not change that. Can Auschwitz Be a Graveyard and a Tourist Destination? Posted on January 26, 2017 in: Education, Exhibits, History, Holocaust Centers and Museums, Nazis/Nazism, POLAND, THINK PIECES & OPINION|Comments Off on Can Auschwitz Be a Graveyard and a Tourist Destination? Menachem Rosensaft once wrote that “as much as any other event, if not more so, the Holocaust requires the chronicler to be scrupulously accurate.” He further notes that “the greater the popularity of this subject, the greater the need for vigilance regarding the treatment it is accorded.” As we approach International Holocaust Remembrance Day, we need to be vigilant. Since my most recent visit to Auschwitz, in 2015, I have been particularly concerned that while its museum often uses the term “authentic experience,” visitors are exposed to a variety of nonauthentic experiences. To provide just a few examples, the infamous “Arbeit Macht Frei” sign at the main gate is a reproduction; the Auschwitz I footprint actually extended into the current main parking lot and beyond; the gas chamber/crematorium (Krema I) usually shown at the end of the tour is a reproduction, and in Auschwitz II–Birkenau, the line of barracks (Section BIIA) upon entering to your right have been entirely rebuilt. To be fair, the guides will acknowledge this if asked, but the pressure of mass tourism means that they are rarely asked. I have the utmost respect for the staff at the Auschwitz-Birkenau Memorial and Museum. They have an extraordinarily difficult job where literally every decision or official comment can quickly become controversial, yet they accept the challenge with grace, commitment and passion. The staff must navigate Polish politics, a huge increase in visitors severely straining the infrastructure and financial issues, and they must reconcile various stake-holder groups, each of whom have legitimate, though often conflicting, agendas. But these convenient educational props can undermine their central aim if Holocaust deniers can accurately point to inconsistencies. And while the unprecedented growth in visitors to Auschwitz is in many ways a welcome development, that very surge is hastening the day when the museum’s senior staff, as well as foundation and council members, must decide if Auschwitz is simply an attraction to be checked off a tourist’s list or a sacred site as the location of the largest graveyard in the world created by the greatest crime in human history. In his book “Dark Tourism and Crime,” Derek Dalton describes his fascination in Auschwitz from his teenage years, and the “lure” he felt to it. I am not Jewish, and have no family connections to the Shoah, but since I read a book on the prisoner uprising at Treblinka when I was 13, I’ve felt that same “lure.” My passionate interest in the Holocaust — and, in particular, Auschwitz — has led me to visit the camps on a number of occasions and study the history with more than touristic interest. Auschwitz has come to represent the Holocaust for countless people like me worldwide, and that places a singular burden, responsibility and moral obligation on the museum. The victims and survivors unconditionally deserve historical accuracy in documenting the crimes, proper contextualization, absolute authenticity, respectful memorialization and the most up-to-date interpretations. But despite its best efforts, the museum is not succeeding in providing all this. Historical accuracy is at times compromised by how various items are shown. The disturbing and powerful exhibition in Block Four with the hair of about 90,000 victims shown behind a long glass wall — along with similar displays of luggage and artificial limbs — do not make clear that the hair, limbs, and luggage were taken not there but at Birkenau. Also, the Gypsy-Roma experience predominantly unfolded in Birkenau Section BII, yet the excellent exhibit telling their story is in Auschwitz I. The critical historic importance of the large building where most prisoners first entered Auschwitz I and went through processing is lost due to its contemporary usage as a security checkpoint, bookstore, theater, cafeteria and group tour staging area. If the Auschwitz complex of camps is indeed a sacred place deserving solemnity, reverence and reflection, then the immediate area just outside the actual camp (Auschwitz I) falls far short in signaling to visitors they are about to step on consecrated ground. The dilapidated parking lot with a small white trailer as the main (and only) ticket office also houses an ice cream vendor and a souvenir shop before visitors reach a main entrance in a sad state of disrepair. Neither solemn memorial nor authentic representation, arrival at Auschwitz is now just a shabby trap for the masses of dark tourists. Frankly, the victims and survivors deserve better. The last example is the least comprehensible, most disheartening and, frankly, shocking. The Auschwitz II – Birkenau gatehouse — the Gate of Death — is arguably the most widely recognized building in the world, an iconic manifestation of pure evil. But today, the gatehouse contains a bookstore, restrooms, a small vending area, a rundown guard tower and storage rooms. Does using the gatehouse this way properly memorialize the thousands upon thousands of starving, freezing, emaciated and terrorized prisoners in their paper-thin uniforms and ill-fitting wooden clogs who went through this gate in the morning knowing that there was a good chance they would not return? How can this be the best use of a horrifying historical building that welcomed some 1.1 million victims to this camp of death? Can Auschwitz be both a tourist attraction and a mass graveyard without making compromises that betray the memory of the victims? The decision needs to be made soon. Sterne [Stars], an East German-Bulgarian co-production that won a major prize at the 1959 Cannes Film Festival and thereafter fell into obscurity, is itself the story of a memory on the brink of oblivion—a movie in which, for a few hours, time stands still before swallowing its protagonists. Showing this Sunday, Jan. 22, at the New York Jewish Film Festival in a new digital restoration that will doubtless be surfacing elsewhere, Sterne concerns a transport of Greek Jews, en route to Auschwitz, detained by some bureaucratic snafu at a remote Bulgarian village. They are corralled in the town for a day or two, just long enough for Walter, a bored, somewhat self-pitying German corporal tasked with overseeing these surprise arrivals, to develop a crush on one of their number, a young and radiantly selfless Jewish schoolteacher named Ruth. The corporal, whose fellows have given him the mocking sobriquet “Rembrandt,” is a would-be artist. Not especially sensitive but nothing if not alienated, he is contemptuous of his German comrades and, vaguely yearning for some sort of contact, seeks a measure of acceptance from the locals he supervises, ignoring the fact that some are certainly partisans. A similar longing accounts for his fascination with Ruth who, in their first meeting, shames him into grudgingly providing the deportees with a bit of humanitarian assistance. Walter turns out to be a romantic but Sterne, like Ruth, recognizes the impossibility of this brief-encounter romance. Walter’s several meetings with Ruth—who is, in effect, arrested so that he might enjoy her company—are luminous nocturnes in which the couple walks together through the deserted town. Stars shine down but the conclusion is forgone. Each time, they wind up in the graveyard. Directed by Konrad Wolf from a screenplay by Angel Wagenstein, Sterne is a fairy tale, albeit a hardboiled one that never forgets the degraded conditions of the deportees or their fate. The story of Walter and Ruth is an extended parenthesis. Sterne is framed by performances of the Yiddish poet Mordechai Gebirtig’s Jewish-resistance anthem S’brent [It Is Burning], a song that circulated throughout the ghettos of Nazi-occupied Poland. Its first scene, with the Greek Jews lined up in the rain and packed into cattle cars, is repeated at the end. As a movie, Sterne manages to be both lyrical and monumental. As a statement, it practices a dialectic of unity and isolation. “What was he looking for in our little Bulgarian town?” the film’s narrator asks over introductory footage of Walter wandering through the marketplace. The answer is: his humanity. Sterne is striking for its internationalism, particularly in a linguistic sense. The dialogue is in both German and Bulgarian. In addition to Gebirtig’s Yiddish laments, the movie includes the Hebrew prayer “Eli, Eli.” Ruth addresses her pupils in Greek. Most remarkably, there is an extended scene in which, among themselves, the Jews speak Ladino—making Sterne the only feature I know with dialogue in the language of the Sephardim. While the film is not devoid of Communist idealism, the rote affirmation in which Walter finds solidarity with the (presumably Communist) partisans is subsumed by the final image of Ruth clutching at a train’s barred windows, speeding toward death as she stares into the camera, leveling a j’accuse at the audience. Sterne is not only universal but highly specific with a backstory that requires a bit of unpacking. Bulgaria was something of a sideshow during World War II, although, as an ally of the Axis, the Balkan kingdom received chunks of Romania, Yugoslavia, and Greece—including parts of Macedonia and Thrace—then home to some 14,000 Jews. While old Bulgaria’s 50,000 Jews were deprived of their rights, they were never, despite German insistence, deported en masse. On the other hand, Bulgaria provided the German army a land corridor to invade Greece and, starting in 1943, for some 75,000 Greek Jews (most of them from Salonika) to be shipped to Auschwitz. The government also allowed the Thracian and Macedonian Jews to be deported as well. Dated October 1943, Sterne conflates the deportation of Greek and Thracian Jews while speaking to Angel Wagenstein’s personal experience. A Bulgarian-born Jew who spent his childhood in France, Wagenstein returned to Bulgaria to study and was an anti-fascist partisan during the war; in some sense, the movie is autobiographical. In Andrea Simon’s documentary-portrait Angel Wagenstein: Art Is a Weapon (having its world premiere at the NYJFF), Wagenstein recalls witnessing the deportation of the Thracian Jews. He also suggests the character of Walter was based on an actual German corporal and identifies Bansko, the town in southwestern Bulgaria where Sterne was shot, as the cradle of the Bulgarian resistance movement. Konrad Wolf’s experience of the war was less direct. East Germany’s leading director throughout the 1950s and ’60s, he was the son of the German-Jewish dramatist, medical doctor, and left-wing activist Friedrich Wolf (and the younger brother of East German spymaster Markus Wolf, whose autobiography, Man Without a Face, is filled with admiring references to his sibling’s movies). Friedrich Wolf was briefly jailed for his 1929 play Cyanide, a defense of abortion rights, and went into exile once the Nazis came to power in 1933. His next drama, Professor Mamlock, which was written in France and premiered at the Warsaw Yiddish Art Theater in 1934, was among the first works to dramatize Nazi persecution of German Jews and made his international reputation. Professor Mamlock was filmed in the Soviet Union, Wolf’s adopted country, where it was well-received in 1938. His son Konrad released the film 23 years later in East Germany, to lesser acclaim. Not the first European film to depict the Holocaust, Sterne actually postdates a small cycle of movies were made in the 1940s. The earliest was a Soviet film, The Unvanquished (1945), directed by Mark Donskoi and starring Yiddish actor Venyamin Zuskin, that depicted a mass execution of Jews filmed on location at Babi Yar. One of the first films produced by the new Polish film industry, Natan Gross’s Yiddish-language Undzere Kinder (Our Children), 1948, was a semidocumentary of Jewish war orphans, many of whom enacted their actual situation for the camera. Two related films were produced almost simultaneously in Poland: Wanda Jakubowska’s powerfully disorienting The Last Stage (1948) was based on her own experiences in Auschwitz, and Alexander Ford’s Border Street (1948), a Czech-Polish co-production, had the Warsaw Ghetto Uprising as its climax—scored to a near oratorio by composer Henoch Kon. The masterpiece of this tendency was the Czech filmmaker Alfred Radok’s Distant Journey (1948), in which a Jewish doctor briefly forestalls her deportation to Theresienstadt by marrying a Czech colleague. 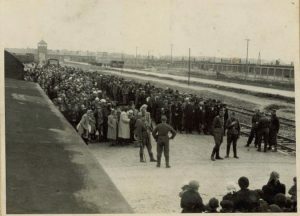 As The Last Stage was partially shot on location in the women’s section of Auschwitz-Birkenau, so Distant Journey used Theresienstadt, where both Radok’s Jewish father and grandfather died. When the movie was shown in New York in September 1950, the Yiddish press reported the amazed public response of at least one spectator, who said that she recognized her fictional self in the film. The shock of recognition is crucial. Even today, Distant Journey et al. retain the urgency of an immediate response. These eight films, plus Sterne, have several things in common. All, except Long Is the Road, were produced by Communist film industries that were not eager to focus on a specifically Jewish calamity. They are, in many ways, special cases. The most important thing was that they were made by and/or with people with first-hand experience of the Nazi war against the Jews—and can be considered a form of group psychodrama. More than movies, they were a form of testimony, not all of it welcome. The state gave and the state took away. That, in most cases, these films were subsequently banned or shelved may explain why it has taken so long for them to enter the canon of Holocaust films. Shown at the first post-war Venice Film Festival, The Unvanquished received an award but disappeared from Soviet screens—and history—around the same time as its lead actor, Venyamin Zuskin, a victim of Stalin’s anti-Semitic campaign. The Last Stage, which won the Crystal Globe at Karlovy Vary International Film Festival in 1948, was considered acceptable, but Undzere Kinder was not. It was never shown in Poland (and also did poorly when a print made its way to Israel in 1950). Border Street was highly popular in Poland until it was banned, supposedly by order of Stalin, and likely cost Ford his job as the head of Polish film production. Distant Journey, which, like Border Street, acknowledged the role of indigenous anti-Semitism, was banned in Czechoslovakia—even as it was distributed abroad—and served to compromise Radok’s career. Sterne was the first film to implicate Bulgarian authorities in the deportation of Thracian and Macedonian Jews. Despite its international acclaim, the movie was banned in Bulgaria for its “abstract humanism,” and Wagenstein did not make another film for several years. NOBLESVILLE, Indiana — Neighbor turned against neighbor. Family members disappeared. Faced with ostracism or even death, youth pledged allegiance to a cause they hadn’t necessarily sought — and committed unspeakable crimes against their countrymen. There are still landmines in Cambodia, where an estimated 1.7 million people died between 1975 to 1979 under the extremist Khmer Rouge government. Today, however, many of these landmines are not physical, rather unspoken tragedy that looms from the past into the nation’s future. Some 70% of Cambodians were born after the notorious Killing Fields, but mandatory education about the genocides only began in 2009. And while the Khmer Rouge government ostensibly fell in 1979, in a pragmatic attempt to unify and stabilize a nation reeling from murder and betrayal, Cambodian politicians quickly formed alliances with Khmer Rouge members: Cambodian Prime Minister Hun Sen, one of the longest-serving leaders in the world, is himself a former member. Cambodia is now facing a turning point, said Youk Chhang, executive director of the Documentation Center of Cambodia (DC-Cam), the world’s largest archive of photography and documents relating to the Khmer Rouge. “On the one hand, Cambodians run a real risk of losing a firm grip on understanding, memorializing and ultimately accepting a difficult past. On the other hand, a rapidly globalizing Cambodia must take on new challenges of sustainable growth, democratic integrity and human rights,” said Chhang, who was named Time Magazine’s “100 Most Influential People” of 2007. DC-Cam was founded in 1994 through a grant to Yale University from the United States Congress’ Cambodian Genocide Justice Act. Today an NGO, the organization addresses the country’s genocidal past while working to preserve memory and justice. Chhang told The Times of Israel that one way to deepen the understanding of the Cambodian tragedy is through the study of other global genocides. 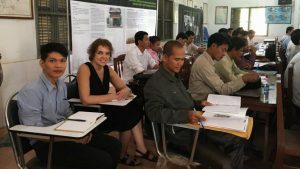 Enter Kelly Watson, an eighth grade English teacher from Noblesville, Indiana, who recently spent a week in Battambang, Cambodia, teaching about the Holocaust. Sound like the wrong cue for this post-genocide Cambodian stage play? That’s because Watson wasn’t exactly typecast. In a cute coffee shop chosen to show off the historic Noblesville town square, Watson said that in her first gig as an English teacher back in the mid-1990s in Lebanon, Indiana, she wasn’t what one could call an expert in the Holocaust when her department chair handed her a rummage sale copy of Elie Wiesel’s “Night” to teach the class. Reading the Wiesel masterpiece memoir set in the Nazi death camp Auschwitz, she quickly understood she just didn’t have the professional background or tools to do the topic justice. But she couldn’t find the appropriate resources in Indiana. The early 1990s, however, was a tipping point for Holocaust awareness in the United States. With “Schindler’s List” and the much publicized opening of the United States Holocaust Memorial Museum (USHMM) in 1993, the topic was becoming more accessible to a growing audience. And so, although she’d never before left the state of Indiana on her own, Watson applied and was accepted to the Washington, DC, museum’s Belfer National Conference for Educators. That conference led to a subsequent fellowship at USHMM, and eventually Watson became a part of the museum’s Regional Education Corps. In between her day job as an eighth grade English teacher (now at Fishers Junior High) and parenting, Watson began to lecture, among other places, at Indiana’s Bureau of Jewish Education, which today supports the Holocaust Education Center of Indiana. She had become the resource she herself had sought. While acquiring the skills to be an expert Holocaust educator at USHMM, Watson met a number of like-minded teachers who wanted to apply the lessons learned from the genocide against the Jews in other conflict zones. Independently, these friends organized trips to teach in Rwanda and Bosnia, before eventually founding a non-profit in 2011 called the Educators’ Institute for Human Rights. Watson is currently an educational program director for EIHR. The project, she said, teaches the best practices of Holocaust and comparative genocide education to teachers, who bring them into the classroom. Two years ago, with the Rwandan and Bosnian programs ongoing since 2011, EIHR was ready to expand to other conflict zones. Watson chose Cambodia and said she “blindly emailed” DC-Cam’s Youk Chhang, whom she calls “a force.” He immediately responded and the past two years were spent in planning. In October, Watson was the first EIHR emissary to Cambodia, where she presented on the Holocaust to 100 Cambodian history teachers. With enough troubles of their own in their recent past, why should Cambodians want to learn about the Holocaust? “The history that precipitated the Holocaust carries lessons for every human being regardless of culture, religion, or circumstance,” Chhang explained to The Times of Israel. In 2002, Chhang initiated and edited a translation of “The Diary of Anne Frank” into Khmer. It was distributed to high school students and also broadcasted on local radio stations “to inspire the local population to learn about their own Anne Frank of the Killing Fields at home,” said Chhang. “Cambodians studying the Holocaust… can discern lessons that are useful today. The resilience of the survivors of the Holocaust is a reference for how Cambodians can overcome their past,” Chhang said. In 2007, DC-Cam published its high school history text book, which included Cambodia’s own genocidal past. “In 2009, it became compulsory for all high schools across the country – which is over 1,700 high schools,” said Chhang. Despite exposure to “The Diary of Anne Frank,” Cambodians know little about Jews or Judaism, or the Holocaust, said Watson. With Watson’s help and that of teachers like her, Chhang is hoping to change that. He said DC-Cam has a variety of proposed national projects to integrate more Holocaust and other cross-cultural mass atrocity education into Cambodian public schools. “As the principle partner working with the Cambodian Ministry of Education, we intend to incorporate more educational modules addressing the Holocaust as well as other examples of mass atrocity,” said Chhang. The US Holocaust Museum is currently hosting two exhibits through October 2017, which highlight the Khmer Rouge period: “Cambodia 1975-1979” features survivor testimony, photographs and videos, and “I Want Justice!” depicts efforts of post-genocide retribution on perpetrators — from the Nazi Nuremberg trials to today’s prosecution of several key Khmer Rouge members. In late November, a 2014 conviction was upheld of two surviving top Khmer Rouge leaders of crimes against humanity, including extermination, enforced disappearances and political persecution. Currently, they are on trial for, among other crimes, separate allegations of the genocide of Cambodia’s ethnic Vietnamese and Chams. In addition to museums, the comparative study of genocide among scholars is now de rigueur. Across the globe, there are undergraduate and graduate university programs for Genocide Studies, most with a concentration on the Holocaust. The Yale University Genocide Studies Program, however, was founded in 1998 after originally concentrating on Cambodia (the genesis for the NGO DC-Cam). Today, the program covers topics ranging from Ancient Genocides to War Crimes and Truth Commissions. Exhaustively collecting information and comparing it with other cases, allows scholars to “explore what similarities exist (for instance in the statements, plans, and activities of the perpetrators), and therefore try to identify in advance what might become the signposts to the next case of genocide, and enable humanity to stop it before it occurs,” said Kiernan. “At the very least, careful comparison of different cases of mass murder often reveals unexpected similarities,” he said. According to Watson, teaching a comparative study of genocide has other, more immediate and personal implications as well. In looking at their own genocide through the prism of the Holocaust, after decades of suppression of memories, the Cambodian teachers may feel “safer” in addressing them, she said. Many teachers in conflict countries are survivors of genocide themselves, if not the children of survivors. It is important, said Watson that they feel part of a community that understands what it means to be facing a classroom filled with children or grandchildren of perpetrators. After this first initial visit by Watson, there are plans for more Educators’ Institute for Human Rights teacher trainings in Cambodia, as well as a swap with teachers in the US. Through the dissemination of their personal experiences, alongside the acquisition of theoretical knowledge of genocide, DC-Cam’s Chhang hopes these teachers can make a positive change in the world. “The circumstances that precipitated the descent into violence and the dehumanization of people bear witness to ways to improve the human condition and make the statement ‘never again’ really matter,” said Chhang.